Note: Maintaining a scientific data set to professional levels of quality assurance is beyond our resources. These results are therefore presented as a best effort. Scientific results should ideally be based on data from a range of sources. There are two versions of the temperature series. The version 1.0 series are monthly updates of the calculation as presented in Cowtan and Way (2014). These will be updated to include December 2013 and then discontinued. The version 2.0 series are based on a more rigorous treatment in which the land and ocean data are reconstructed separately and then blended. Version 2.0 data are also based on the full HadCRUT4 ensemble, and include ensemble as well as coverage uncertainty estimates. The data are described in this update. All except the long (1850-present) reconstruction are rebaselined on 1981-2010. Rebaselining the data on the period 1981-2010 enables the satellite data to be used for infilling, and in the v1.0 calculation increases the reliability of recent trends, but also discards some data which may impact the reliability of long term trends. Update 2014-10-07. CRU have updated their station data to version 4.3. Observations have been introduced for a number of important high latitude stations for the period from early 2012 to mid 2014. Monthly averages post 2012 have changed by up to 0.04C. Monthly averages prior to 2012 show much smaller changes. Annual averages and trends are largely unaffected. Update 2016-09-19. CRU have updated their station data to version 4.5 addressing some issues in China. Today's release includes the updated data to July. The August data will be included when they are released in week or two. The old July data are here. Update 2017-03-27. The UAH hybrid is dependent on the UAH 5.6 data. We have evaluated the UAH 6.0 data and found them to have less spatial correlation with the surface temperatures, and so are less suitable for use in the hybrid calculation. The UAH hybrid will only updated to the most recent UAH 5.6 data. 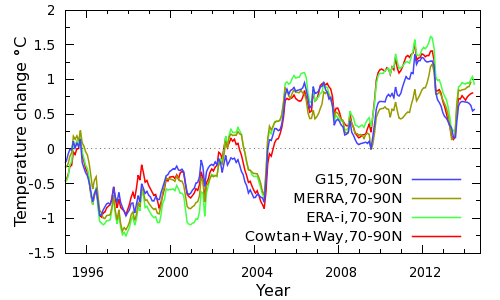 The MERRA reanalysis has been replaced by MERRA-2 which omits 1979, so the MERRA hybrid has been updated to use the MERRA data for 1979 and the MERRA-2 data for the period 1980-present. This will be updated periodically but not monthly. Update 2017-11-07. Added a long temperature reconstruction using COBE-SST2 in place of HadSST3, which is relevant to "hiatus" discussions since COBE-SST2 seems to be unaffected by a drift in ship observations over the past decade. CRUTEM4 land-only infilled by kriging, land masked. COBE2CRU based on HadCRUT4 land ensemble median and COBE-SST2 (no uncertainties). Temperature files contain 5 columns: date, temperature, total uncertainty (1σ), coverage uncertainty (1σ), ensemble uncertainty (1σ). Map data are in a similar format to the ascii files provided by Hadley or NCDC, i.e. 1 line with year and month followed by 36 lines of 72 values. The land temperature reconstruction is used for air temperatures over land and sea ice, and the sea surface temperature reconstruction for open sea. Sea ice coverage is fixed for each month of the year, and is determined from HadISST using the period 1981-2010. For the long reconstruction (i.e. 1850-present) the median ice coverage in the given month of the year is used for each cell; for the short reconstructions (i.e. 1979-present) the minimum ice is used. Hybrid data use the hybrid approach for air temperatures over land or sea ice, and kriging for sea surface temperatures. Temperature files contain 3 columns: date, temperature, standard deviation (1σ). Map data are in a similar format to the ascii files provided by Hadley or NCDC, i.e. 1 line with year and month followed by 36 lines of 72 values. Gleisner et al mean of zonal means. Note: this method performs poorly in validation. Arctic trends are similar to our kriging reconstruction and the reanalyses, however coverage bias elsewhere is not well handled. Global mean: monthly. Gridded data: ascii. Data and methods: (code).